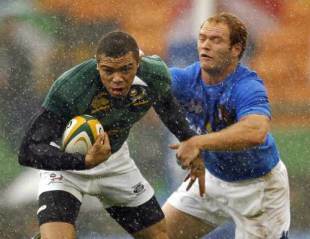 In seven meetings South Africa have never lost to Italy, and Peter de Villiers' side will be looking to extend their record in Udinese on Saturday. The two sides first met in Rome in 1995, when the Italians notched their most competitive score of 21-40 in Rome. South Africa's most impressive victory was in Durban in 1999 when the Springboks romped to a 101-0 victory, scoring 15 tries to no reply. Winger Stefan Terblanche got five tries, while Deon Kayser got his international career off to a flying start, coming off the bench to score a hat-trick on his debut. Click Here for Italy's full Test record courtesy of Statsguru.